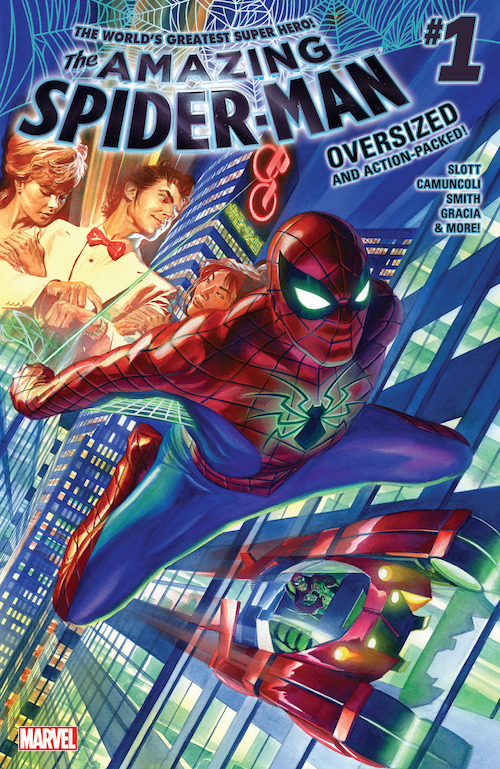 It doesn’t feel like long ago that I reviewed the last Amazing Spider-Man #1. It was only last year and the review can be found here. It has however been so long since I reviewed a comic that it was getting close to being a lie claiming that this website reviews comics. We do, honest! Marvel comics seem to have got the reset bug and are rolling back a lot of major series all the way back to number 1 in order to start afresh. At least the previous continuity seems to be intact and there’s a sense that we’re getting out of the God awful “Secret Wars” story. Dan Slott remains the head Spidey writer and I couldn’t be happier with this. I’ve been rereading Spider-Man comics right from the beginning and I’m up to mid 90s where the “Clone Saga” is in full swing. It’s safe to say that it’s not the best work Spidey has ever had so I really mean when I say that it’s important to have a writer on board who really gets the character. A big problem with Spidey through the decades is that he tends to stagnate in order to remain relatable. He is rarely allowed to find a good job worthy of his talents, his dual identity frequently impacts his personal life as Peter Parker and generally he can’t seem to catch a break. Dan Slott’s run changed that by giving him a renewed purpose while still staying true to the fundamentals of the character. Before “Secret Wars” began Peter was trying to find an identity for his company Parker Industries and was starting to come round to the idea that there are more effective ways to live up to Uncle Ben’s example and help people. By the time we get to this relaunch Peter has really capitalised on this opportunity and taken his company as well as Spider-Man global. He remains true to his values even though he’s a big shot CEO by making sure that all manufacturing is done to the highest standard and fair wages are paid. He has even capped his salary so that he doesn’t earn any more than his junior executives because he doesn’t want to be seen as the greedy CEO. He’s never been that sort of guy and it’s good to see that wealth doesn’t spoil him. The considerable resources at his disposal are used to help people and as a result the profit margins for his company are quite slim. It’s a very Peter Parker way to conduct business and it’s a great way to allow his character to develop. I really like the way his integrity shines through when he refuses to hand over intel to S.H.I.E.L.D. and tells Nick Fury that they do it his way or he stops designing tech for them. Fury has to agree and the matter appears to be closed. Maybe if the films stop rebooting the character every 5 minutes we could one day get to this point. Peter is using Spider-Man as something of a company mascot with the public still unaware of who he really is. A comparison is made to Tony Stark who used to pretend that Iron Man was his body guard instead of actually being him. The arrangement here is somewhat similar and Peter has employed Hobie Brown to pose as Spider-Man to keep people guessing. It’s a clever way for him to combine his personal life and his secret identity in a way that shouldn’t raise too many questions. The action beats in this story were awesome. Spidey’s high speed chase through Shanghai in the new and improved Spider-Mobile is beautifully drawn and hugely exciting. This new Spider-Mobile is no joke like the last one that’s for sure. Using Mockingbird as the S.H.I.E.L.D. liaison makes for a hugely entertaining team up. They bounce really well off each other with Spidey’s banter being razor sharp. I do love to see the character have fun like this. I also like the villainous force Zodiac as they fit well into this corporate version of the Spider-Man story. They should provide a suitable antagonist for Peter as this story develops. A burning question that has existed since Spider-Verse is what Doc Ock’s contingency plan was. We get an idea of what that at the end of this story when it is revealed that his consciousness is hidden inside the robot assistant he had. To be honest I should have seen this coming as it’s exactly the sort of thing he would do. It’s too early to say if it’ll be good or not or what his resurrection plan will ultimately be but colour me interested. I can’t fault this story on almost any level but this new direction for Spider-Man is going to take some getting used to. It’s interesting to see him move past his self doubt and use his gifts to benefit the world but part of me misses the old school swinging around on patrol and dealing with what he can. This could prove to be better in time and I’m glad to say that I enjoyed it immensely. I’ll get over it is what I’m saying. Another thing I can’t help wondering is what happened to the “Renew Your Vows” story. If Peter was living this life with Mary Jane at his side this would be all but perfect. Apparently she’s moving to Iron Man for some reason so that’ll be strange. A great start to the relaunch of Amazing Spider-Man that takes Peter Parker in an exciting and dynamic new direction. The idea of Peter Parker using his company to go global and use the vast resources at his disposal to help people in different ways. Prior to “Secret Wars” Dan Slott had started Peter Parker down a path that would have him realise that he has a limited view of responsibility. This story is the logical conclusion of that as he now realises how he can better help people. Peter hasn’t lost sight of who he is as he keeps the profit margins low and caps his salary at the same level as his other executives so that nobody can accuse him of being a hypocrite. His new tactic for hiding his identity by copying the Tony Stark model of saying that Spidey is his bodyguard which lessens any suspicions people might have. I loved the action beats in this comic. Spidey and Mockingbird are a fun team-up that bounce off each other really well and Spidey’s wit is razor sharp. This story should turn out to be impressive. The hint at the return of Doc Ock isn’t much to go on at this point but seems interesting so far. It’s consistent with what he would do certainly. It’s a personal thing but I don’t really like the new suit. The original is much better and this feels like a change for the sake of a change. I also miss Spidey’s old tactic of patrolling New York trying to help out where he can but these are minor personal niggles.